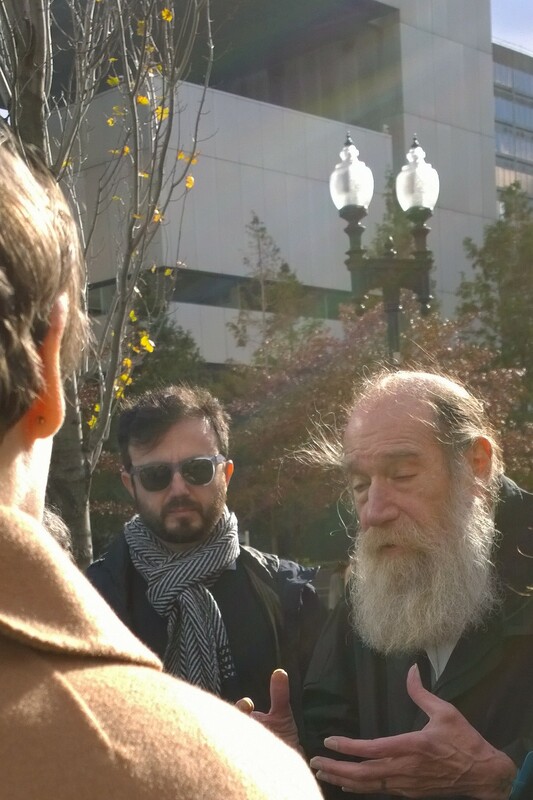 Lawrence Weiner discusses art in Dewey Square. I am letting it sink in. Perhaps it’s about the translation from the artist’s idea to a work that others see. Perhaps something is lost in the translation. Perhaps it’s about how differently we understand one another, even without so-called language barriers. 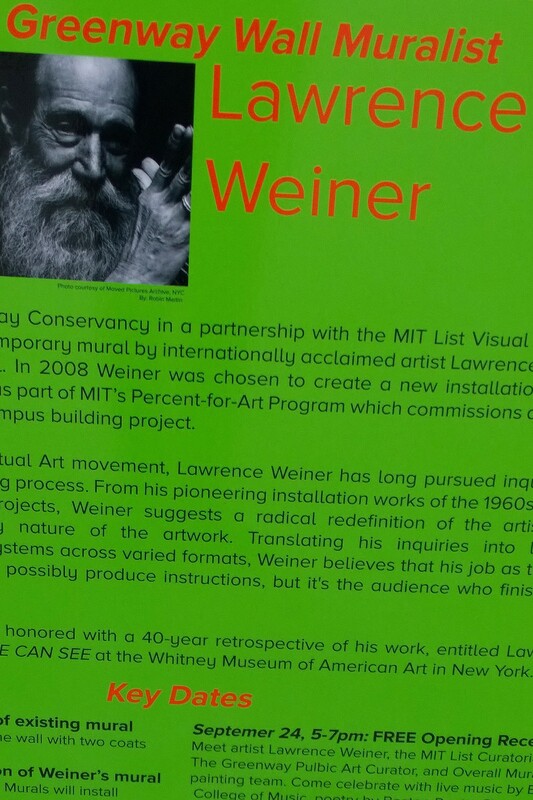 Here’s what the Greenway writes, “Lawrence Weiner is considered a key figure in the Conceptual Art movement, which includes artists like Douglas Huebler, Robert Barry, Joseph Kosuth, and Sol LeWitt. “A primary motivating factor behind Weiner’s work is the desire to make it accessible, without needing to purchase a ticket or understand a secret visual language. He contended that language reaches a broader audience, and situating language in contexts outside traditional art-viewing settings, such as art museums, furthers that reach. “Thus, he began creating works consisting of words and sentences or sentence fragments that he displayed in public spaces, books, films, and other accessible media, as opposed to the cultural institutions that might deter broad and diverse viewership. 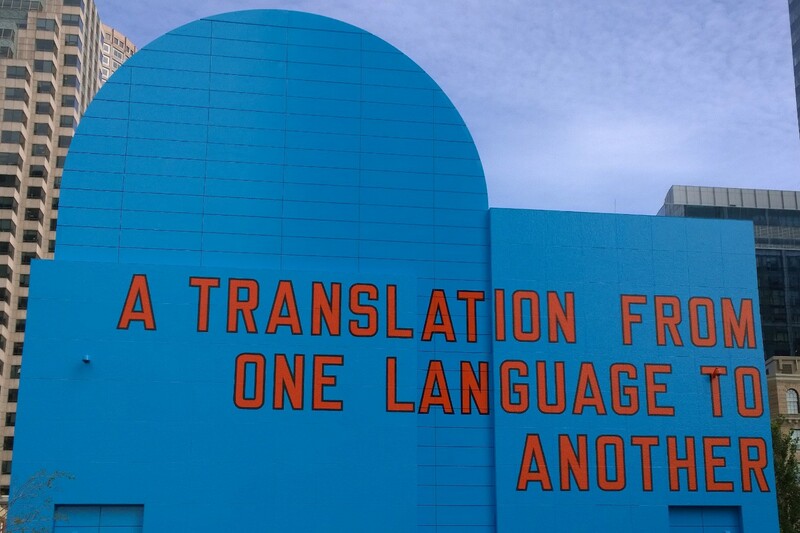 Click here for an interview with Lawrence Weiner.” More at the Greenway site. Malcolm Gay at the Boston Globe adds, “For Weiner, the work is less about art historical knowledge, outrage, or relating to other people. It’s about a viewer’s individual response to an object in the world — an object that’s been created by another person. It will be up for a year, so maybe you will see it.